The Reds attempt to snap a four-game losing streak tonight in Milwaukee. They have fallen to 3.5 games behind the Brewers and are in fourth place in the division. Game time is 8:10 p.m. Weather forecast doesn’t matter because of the roof. Homer Bailey takes the mound for the fourth time this season against the Brewers. Most recently, two starts ago, he went eight innings but lost a 1-0 duel with Matt Garza who limited the Reds to two hits while striking out nine. Bailey’s foe tonight is not Garza, it’sÃ‚Â Jimmy Nelson,Ã‚Â a 24-year-old rookie making his third start of the year for the Brewers. He’s considered the top prospect in Milwaukee’s system. Keep in mind that every organization has to have a top prospect, no matter how good he may be. Nelson is rated B by John Sickles and a possible #3 or #4 starter. He’s ranked the #63 prospect by MLB and their report on him says that scouts remain split on Nelson, who is viewed by some as a possible reliever. Nelson is a ground ball pitcher with a may-reach 96-mph fastball (average: 93.1) and a power slider. On July 12, Nelson was utterly rocked by the light-hitting Cardinals. DL News: The Reds placed Logan Ondrusek on the DL with a strained right shoulder, retroactive to July 13 (Mark Sheldon). RHP Curtis Partch was called up from Louisville. Devin Mesoraco is sitting out this game, for the second time since the All-Star break.Ã‚Â Price was asked about it and said the Reds needed a really good start from Bailey.Ã‚Â Ã¢â‚¬Å“We need a really good start,Ã¢â‚¬Â Price said. Ã¢â‚¬Å“Homer threw really well in San Francisco against the Giants when he threw to Pena. Over the course of their careers together, Homer will throw a lot to Devin. Devin has scuffled a little bit at the plate. I think a day off isnÃ¢â‚¬â„¢t the worst thing and putting those two together is good as well.Ã¢â‚¬Â (Mark Sheldon) Hmm. Mesoraco caught Bailey’s great start against *the Brewers* two weeks ago. Skip Schumaker (.255/.303/.340) is batting second. The way Ryan Ludwick has looked against hard-throwing pitchers lately, I’m not sure about the match-up with Nelson. Todd Frazier is back at first base which means Ramon Santiago is playing third, weakening the Reds at both positions defensively. So Darwin Barney was DFA’d. does DFA mean that he is optioned if he has an option available? DFA means he is designated for assignment to (immediately) clear a spot on their 40 man roster as well as the 25 man roster. The Cubs have up to 10 days to do something with him. If they can’t trade him; and he clears waivers, then they can outright him to the minors. I believe he would have the right to refuse to be outrighted and instead could elect to become a free agent. Big caveat. If he chooses free agency he forfeits his remaining salary for the year which is guaranteed because he was on the 5 man opening day roster even if not directly guaranteed in the contract. Cot’s contracts says he signed for $2.3M for this year with no extended obligation, so he is still due between $750K and 800K for the rest of this year. Given that in his entire career before this season (including initial signing bonus) he has “only” made around $4M, it is hard to see him putting the balance of this year’s salary at risk I’d judge. So a team is probably going to have to trade for him or win him on a waiver claim to get him now. This personal catcher stuff needs to stop already. Bailey needs to get over his dislike of throwing to Mesoraco. The team is on a 4 game losing streak where they’ve scored a grand total of 6 earned runs, all from solo homers. You’re up against the division leader. You can’t afford to take one of your two good bats (Mesoraco) and put him on the bench and then move your other good bad (Frazier) out of position. It’s not like the Reds have the offense to spare. Nothing about this report says it is due to Bailey’s “dislike of throwing to Mesoraco.” Nothing. That’s just more of your Homer bashing. Don’t put the blame on him. Did you read what Price said? Partly due to Mesoraco being 0-11 and Pena with two home runs in NY, I suspect. Bailey has pitched to Mesoraco and well. Who cares if he wants to pitch to Mes or not. I think Homer’s best outing was with Pena behind the plate (SF). If it works, who should care? If Homer pitches like Homer can, a run should do it. We argue all the time about advanced statistics but I will say this: HB has the best stuff out of the starters. We need to get him to reach the potential, that he is blessed with. If that is bashing, then I guess I’m bashing..
To be hung up on a personal pitcher, or not, is missing the point. How about we see if this pair works and go from there? Winning games is too important to get hung up on nonsense like this, guys. I don’t see how an 0-11 stretch now effected all those times in the past. Devin Mesoraco has only caught 12 of Bailey’s 20 starts. Last year Corky Miller started 12 games. Eight of those were for Bailey’s starts. Mesoraco only started 5 of Bailey’s starts last year. Miller had a career 49 OPS+ before last year. Despite being the majority starter at the position the last two years, Mesoraco has caught 17 of Bailey’s 52 starts in that time span. Either Bailey doesn’t like throwing to him, or it’s just some crazy two year happenstance. I think there is probably something to it but I’m not going to get hung up on it. I look at Homer and wonder why is this guy’s ERA not under 3.00?? If it just so happens that he does pitch effectively to reach that number, with Pena, is Mes really going to make up the +1 run/game difference?? The real problem is Mes needs to be able to play another position, in addition to catching, to maximize his value. I want to see Devin Mesoraco out there 150+ games. I like Bailey with Pena. I think HB gets discouraged easily when things don’t go right. It’s just an opinion and probably a 98% chance I’m wrong; however, if I just happen to be right…………: Pena has a softer touch when dealing with the pitchers, I see DM as a tough love kind of guy. If HB is already down on himself, I want a softer touch (Pena). Is that some crazy thinking or what – just killing time. Bottom line Homer Bailey should be a much, much better pitcher then he is and what does it hurt to let Pena work with him and see how it goes? Whatever works best is the thing I want. Homer, to me, is a diamond in the rough. I like Homer with Pena too. But Mez should catch Cueto. With Pena at 1b preferably. But right now if I had to choose: Cueto & Mes, and Homer with Pena. If I was any of the starters, Pena would be my preference. I like this guy’s attitude and it appears he can lift you up when you need it. Nothing against Mes but I do think Pena has a certain gift. If anyone disagrees, that is more then okay with me. Whoever is to blame for Mes sitting, be it Bailey or Price, it’s the wrong decision. Doc, here is my point: if Homer throws a gem tonight, why not let Pena catch him his next start? If you would, please argue it from that point of view. I just don’t believe that the cake a catcher adds in calling a game justifies taking your best bar out if the order when the problem all week has been scoring runs. One is a minimal, subjective advantage, the other is a tangible, objective difference in the number of runs you can expect to score. If you don’t trust Mes to call games in important spots the. We’re screwed. Not just tonight or this season, but for years. Hell – call every pitch from the dugout if you want. You’re a pitching coach, after all. Can you try to answer my question? I thought I did. Our priority right now should be offense. A major league pitcher should be able to prepare a gameplan with a major league catcher so that they are on the same page. There shouldn’t be a consideration of “game calling” when writing a lineup card. Go with the better bat and make sure the battery is in sync. I’ll take that as a no. I’m betting Homer pitches lights out tonight and Pena catches him his next start. And again, Price is perfectly capable of calling every pitch of the game from the dugout. If there’s any concern that Mes doesn’t have the brains to call an AB then Price can tell him to look to the dugout after every pitch to know what signs to throw. You’ll take that as a no? I just answered your question three times. Let me make this clear: Game calling should not be an issue when deciding who should be starting at C. Period. WILL they do that? Maybe, because Price learned baseball managing from Dusty. SHOULD he do that? No. No. No. No. No. No. Have I answered your question enough times? Except there’s no consistency between Homer’s catcher and what he does. Mesoraco started his June 24th game. Bailey went 5.1 innings, 4 ER. Pena started his June 29th game. Bailey went 9 innings, 0 ER. Mesoraco started his July 5th game. Bailey went 8 innings, 1 ER. Pena started his July 10th game. Bailey went 5 innings, 3 ER. I am just going to go ahead and assume regardless of who is catching, it’ll be the same. Inconsistent performances ranging from occasional flashes of ace stuff, to absolute horrible headcase blowups. Wasn’t the July 10th game when Homer suffered his injury?? Because if Homer throws a gem, or if he gets shelled, I don’t believe who is catching makes much of a difference, if at all. The difference behind the plate is neglible at best. The difference on offense is huge, though. Pena as a hitter isn’t even on the same continent as Mesoraco. Any reason to believe–from the Cardinals game maybe?–that Nelson really struggles against LH batters? That would explain playing PeÃƒÂ±a over Mesoraco, putting Bruce at cleanup, and playing both Santiago and Schu. Just a thought. I really hope Bruce has returned from his summer vacation. I wasn’t so worried about his offense in NY–it was his defense that concerned me. I would have bet money we would see Pena at 1B and Mes catching tonight with Begron at 2B. There’s obviously information we don’t have, but I wonder if Price is trying to do too much. Take your best hitters and find a way to put them in the lineup. The end. When you’re scuffling for offense you don’t sit your (second?) best hitter. To that end I could even see justifying playing Santiago at SS over Cozart at the moment. One thing I would say is that particularly with a catcher, it is hard to know just how banged up the guy could be; and, Price isn’t going to advertise to the world if it is a situation of sitting one day to save missing several down the line. Good point. And didn’t Mes get HBP on the hand yesterday? Well if Mes is hurt then we’re screwed and they’re just trying to let us down easy. Ha! I really almost agree. I’d just like to see if he actually has some real pop in his bat. Could be trade fodder at worst. Anyone else here amazed Chase Headly was trade for Peanuts! We could have used him at 3B or LF. I think Headley would have been a really disappointing addition that would preclude a better move by subtracting some chips from our farm system. I would have rather seen an Uggla signing, but I’m fine seeing neither. Now, if Walt does nothing in the next week then yes, I would rather have added Headley over standing pat. But I have a feeling there’s something bigger coming. Yanks gave up a minor league free agent signing from this winter and the 15th ranked prospect who is a reliever. We could not find this in our system which is way better than the Yanks? Headley always has hit well in GABP and plays great defense and cost NY 2.8 million, thats all. Compare this to the price for Zobrist, who is a similar player. There is nothing coming before the trade deadline, maybe in August. The pessimism coming out of RLN is close to unprecedented. Walt has 9 more days to make a move and one of his top trading targets has said they won’t decide whether to move until 48 hours before the deadline. Can we all seriously just take a deep breath? Come August 1st if we haven’t made a move I will be right there with you in screaming about how ineffective this FO is but there is a lot of storyline left to play out. Headley would have been a nice addition because he would have cost very little on our end, and could potentially have been a big boost to the offense hitting in GABP. Chase Headley has never played an inning of OF, so I don’t know where that’s coming from. That leaves 3B. Could slide Frazier over to 1B until Votto comes back, then what do we do with Headley in September? Headley was traded for peanuts because that’s how he’s hit the past two years, and been injury-prone. The last thing the Reds need now is to take on another injury case. Headley played most of 2008 and 2009 in LF. Also, Frazier played LF most of 2010 in LF. Yeah, I did that search too fast and was only looking at 2014. If he hasn’t played there since 2009 I don’t know how much help he would be there. The Reds don’t need a terrible outfielder. Headley was traded for peanuts because that’s what an impending free agent who hasn’t hit well this season is worth on the trade market. That doesn’t mean he would be terrible for us. On the contrary, he would be the perfect guy to get when is trade value is at its lowest. Interesting thing. What if Bailey of 2013 is the change from the norm, not Bailey of 2014? ERA, FIP, WHIP, H/9, HR/9, BB/9, and K/BB are all REALLLY close to his career averages this year. The other stats I listed are closer to his career averages than his 2013 season. So… what if this *IS* Homer Bailey and he’s not having a bad year, but just a career average year and this is what we have to look forward to for the next 5 years? Way to bum me out. In my mind, a perfect scenario is that Bailey has a lights out rest of 2014 and we are able to trade him in the offseason. That opens the payroll for a $150+ million extension for Cueto. Then you spend the next year figuring out Latos vs Leake. This a great comparison. If he can be traded to an American League team with a more spacious park in left and right field he might shave .5 off ERA by reducing the HRs he gives up to .75 HR/9. Great time to give Homer B. a chance in the American League for a certified LF but that type of trade would take place at the winter meetings. I do agree that what we see is what we have. This “IS” Homer. Boy am I glad you put didn’t W/L record in the mix. Not sure what opened the gate on your Homer Hatred tonight. I’m not going to argue with you about it because nothing I say will change your mind. I’m just going to say how I look at his career arc. Other people can decide for themselves which is the most reasonable view. Homer Bailey isn’t anything like the pitcher he was 2007-2009. So including those numbers in trying to make sense of what to expect from him is pointless. Starting in 2010, using the big-picture numbers that best reflect how he pitched (at least these are the ones I look at in evaluating pitchers) xFIP and SIERA, his numbers finally fell below 4.00. They were in the 3.75-3.90 range in 2010, 2011 and 2012. 2013 was clearly his best year to date. His xFIP (3.34) and SIERA (3.32) were career lows, by a good margin. The “looking under the hood” numbers back that up. Bailey’s strikeout percentage, line drive rate, ground ball rate, swinging strike rate and fastball velocity all moved strongly in the right direction. 2014 has not been as good from an ERA standpoint and also a few of the “under the hood” numbers. His walk rate has slid up a bit and strikeout rate has fallen a little. They are more in line with 2010-2012 than 2013. But other “under the hood” numbers like his ground ball rate, swinging strikes and fastball velocity have stayed strong and even continued to improve in a few cases. He clearly got off to a bad start this season, likely related to his spring training groin injury. Since the first month, his numbers have been pretty similar to 2013. His xFIP is 3.54 and SIERA is 3.61. So his 2014 is somewhere between his 2013 season and his 2010-2012 years. That could mean 2013 was a peak (age 27) and he’ll begin a gradual decline that a lot of pitchers do, or it might mean he could use that last 2.5 months to bring 2014 more in line with 2013. Jury is still out. I think this is a more reasonable way to look at his pitching than the way you do, believing him to be an “inconsistent head case” (and showing your true colors when it comes to him). Ã¢â‚¬Å“inconsistent head caseÃ¢â‚¬Â Did I miss something or is this in reference to a past comment? I think it’s reference to Bailey not getting strike 3 call vs Braun, and then delivering the next pitch into the RF stands. So this Nelson kid will throw a gem tonite ? I def. have a problem with Price benching Bruce yesterday just because he was cold for a few games in NY… he has been known to heat up without a need for a day off.. he could have launched an early home run yesterday and it would have changed the entire dynamic of the game… now he is benching Mes because of an 0-11? Sure Pena is a great guy and all, but maybe Mes should be the one taking grounders at 1B instead of Bruce.. isn’t that the kind of thing the manager can suggest to a player? On the pregame radio, Price just said PeÃƒÂ±a is catching Bailey because Price is focused on pitching for this game and feels PeÃƒÂ±a catching Bailey is their strongest battery and gives them their best shot for at least a quality start (none since the break) and hopefully even better. Price said a secondary consideration is Meso’s recent struggles at the plate. Sounds like a bunch of nonsense to me. I request a win, please…for my sanity! Billy’s OBP is gonna take a huge dive if he keeps swinging at everything as I have been seeing lately… yesterday the guy just walked the pitcher and Billy swung at two balls out of the strike zone without taking a pitch. He would’ve struck out looking. He was thrown strikes. You can’t walk when you’re thrown strikes. just now he swung at a ball out of zone to strike out. What are you talking about? First two pitches to him were strikes. when just now? Which AB are we talking about? Just now he struck out on a ball… not saying he should have taken the first two pitches, but he swung at a ball low… that is how they pitched him yesterday as well, he was swinging at low pitches below his knee. Gritty at bat by Schu. Nelson looks like a Latos clone. Way to make that rookie pitcher work. Home run derby screwed up Frazier’s swing. Here we go again…K, GO, GO. Mercy! I have to laugh it looks like Jerry Narron is running this team, he is always on camera and sems involved in everything going on. Listening to Chris Welch justify why Pena should be starting instead of Mes really reminds you who’s paying the broadcasters’ paychecks. Yeah, the “You don’t have that big of a drop off.” bit… just an 87 OPS+ vs 159 OPS+. No biggie. Just a bigger different than Todd Frazier vs Zack Cozart. Call doesn’t go the way he wants it, next pitch is deposited in the stands. Oh hello again Homer Bailey. Bailey missed high, Pena’s target was lower… argh..now back to back… team is snakebitten for sure. No longer snake bitten. They are just bad. Pena helping homer live up to his name. Egads! Mercy. 2 runs behind already. 2 runs deficits have been a death sentence for this team. It’s a Homer run derby. Can Mesoraco come in & catch now? Good thing Pena was catching today; Mesoraco surely would have had Homer throw four meatballs instead of two. Let’s not fully blame Price. The players get paid big money to play better than this. They can play better than this and that is the frustrating part for the fans. It helps to vent by making snide comments we don’t 100% believe. Keeps us sane. Let’s see if Jay Bruce can make any decent contact. Bruce missed that pitch by 3 feet. Odds of a Bruce K? 50/50? Bruce picking up where me left off. Announcers talking up the rookie pitcher. It’s the offense that’s stinks not the pitching of the rookie!!!! Well this game is over. Put enough A-1 Sauce on crow and it not that bad. I still think Bruce is done, just like Tiger Woods. We’ll see. Rookie pitcher. Nelson, has a perfect game. Maybe they should trade for Hanigan just to catch Bailey. Just a little early for the gallows humor, but considering the circumstance I guess it is better than the Walt bashing, that will come later. 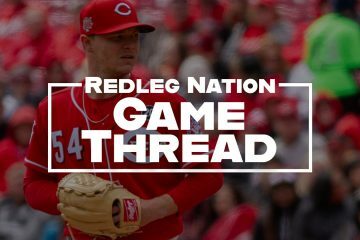 Are the Reds ripe for a no hitter? All pitchers look fantastic against Reds hitters right now. I keep wondering when the pitcher with the ERA of 5.40 who got tattooed by an offensively challenged Cards team is going to show up? Do you think Chad Fairchild behind the plate has anything to do with Mes sitting tonight? Interesting theory, and certainly plausible. It’s taken a week and we’ve gone from optimism of the high point in the season, 1.5 games out and being a buyer (if we didn’t have Jock-less at GM) in the market to being on the verge of being a seller in 4th. Back to small market team on the outside looking in. Well, another ten years and we can compete again with the big boys. Reds fan forever (unless they implement the DH in the NL and then I’m out) but it’s a tough team to follow, not the Cubs, but still tough. At least the Cubs fans know they can get drunk like Harry and everything is alright. Finally, a break goes the Reds way… Let’s get Frazier in and start over. Mancuso called it… Luddy gets blown away by the fastball in a situation where you have to put the ball in play. Sheesh. That was the Reds first earned run since the All Star break that didn’t come from a solo homer. Watching Ludwick is painful; marginal power, average, on base ability at best. His bat speed is gone. Oy. Can someone explain to me how Frazier did not score on the double from Bruce? I watched the replay and they would not even have tried to get him at home. They tried to get Bruce at second. 1 out, but I agree, seemed like he should have scored. But for the 2 home runs, Bailey is cruising. Huge out here if the Reds want a legit shot at winning this game. Pitch/FX has 4 of the 5 pitches thrown so far as strikes vs Gomez. Killer. Homer tried to aim that pitch. C’mon Homer you can do it. Go Reds! I need a drink and i don’t even drink. Looks like the comments are posting out of order. Can someone restart my heart for me. i’m too old for this. I’ve always heard that the Home Run Derby screws up swings. I think it has messed up Frazier’s swing. He doesn’t look like the same hitter. If my memory serves me, Todd looked like he was reverting to the “old” Todd in that last series before the all star break. Reaching at that low outside pitch. Schumaker’s AB looked as bad as Ludwick. No patience at all at the plate with a young pitcher that has been wild the past 2 innings. Looks like most everyone has left so I’m out too. Cards 1 Brewers 5 top 5th. Hah! Boy do I feel like a dope. The Cardinals are playing Tampa Bay. Its Cards 1 TB 6 bot. 5th. Sorry about that. Brewers are reallllly good – playing both the Reds and Cards at the same time — and winning both games. That’s the second fantastic defensive plays by Schumaker this game. Fantastic discipline to not bail out on that ball. That’s a bummer to give the run back. With the way it looks like baseballs are jumping out of here, it makes me sad that Mes isn’t in the lineup, seeing as he’s a legit HR threat. Would have loved to see Mes up there in the 4th with runners on 2nd and 3rd and one out, instead of Ludwick. I have a sneaking suspicion we would have at least 2 runs right now, if not more. Alright, not exactly speed demons on the paths, but there they are. Let’s bring them home. I heart Pena. His split finger and slider both are positive in terms of weighted runs above average. It looks like his curveball and fastball are the problem (in terms of wRAA). Standardized pitch values (takes into account how often the pitches are thrown) show that he is struggling with his curve, but not his other two breaking pitches. These do not consider BABIP or park effects. Please keep in mind this is a descriptive stat, not a predictive one. That butcher boy play would look good here. Luds, why couldn’t that have come back in the 4th inning? This guy is cooked. He’s never gone this long at the MLB level. Gotta get him right now. Bruce might have to move to short stop. Welp, here we go. Can we push a couple across here, or is that asking too much? They better not call that a strike !!! I think Roenicke is challenging to get some time for his pen. What would he be challenging? Wouldn’t it be ball 4 anyway? This guy will walk a run in if the Reds hitters let him. Cozart’s finger has already turned purple. Who plays short if Cozart has to leave? Santiago to short, Frazier to third, Pena to first, and Mes to catch. At least that’s what I would do. If you don’t want to put Mes in, then do the first two changes and put Lutz in at first. Bunting there, especially with the count 2-0 and 3-1 was incredibly conservative and against the odds. AAgree. You fake a bunt maybe, and then swing away. With Luddy on base it really has to be a good bunt anyway. Way conservative… I was a bit shocked. Cozart is hitting .176 this season with RISP (.204 for his career), and tends to either pop up or hit ground balls directly at short or third. It’s a lot easier to imagine a double play than a hit. Santiago has to make some kind of contact here. That kind of contact is fine. Santiago is an RBI guy. Yes – this dude couldn’t find home plate with a compass !!! Need a big hit here… it could change the whole series. Reds have got to make this guy pay for his wildness. Kid really fell apart that inning. Reds really don’t have a hard hit ball this inning. It’s about time those kind of breaks started falling this way a bit. That said, the Reds hitters have terrible strike zone appreciation. On the replay, looked like Santiago took one for the team. He watched the ball all the way in as it hit his foot and never moved it. Course, maybe he’s just old and slow like me. Could be. I like to see that. Heisey just needs to get the run in from third and avoid a double play. Heisey hit that ball right on the nose. We’ll take it. Now it’s time for Billy Ball. Good person to hit it to. Davis throws like Damon. Yeah baby, We’ll take that run. Nice RBI at bat by Heisey. Go Reds! Hamilton needs a good AB here. Look for a walk if it’s there. Keep the line moving. The Reds lead baseball with 50 TOOTBLANs this year (tied with the Rockies) – and they have incredible balance among the team base running blunder leaders: . Good call. Seriously, you should go to Vegas right now. Cozart was just getting head start on coming out of the game injured. Now we will need another infielder! I doubt that bad plays lead to less bad plays in the future, it usually indicates a problem that will continue. Wow, I can’t believe Dale called that TOOTBLAN. How does that happen so much on this team. Ugh. THERE IS YOU DAILY TOOTBLAN – I HSVE NEVER SEEN A WORSE BASERUNNING TEAM THSN THESE GUYS – NEVER !!! Billy hit that ball pretty well. Just right at the 2B. Heisey’s ball was hit hard, too. Cozart shouldn’t have been running on it, though. Sometimes you hit ’em hard and get nothing to show for it. That’s baseball. I don’t know how you can watch that play in real time and blame Cozart. Yeah, he was far off second at the start of the play. Not really much of a chance to get back. It’s Negron time. He’s getting the game winning hit. This team has a serious dearth of mental toughness. You can’t blame Cozart for that. That was terrible luck all around. Huh? Baseball 101 says you’re supposed to make sure a line drive goes through before taking off. Even if he wasn’t running, if he was just on a standard lead off that ball was in the glove before he could have gotten back to the bag. The shortstop beat him to the bag. Any baserunner in the league would have been running on that contact. It looked like a sure single to CF. Wouldn’t have been physically possible to get back in time to beat a tag even if he froze on contact. You head back toward 2nd until you see where it winds up, and if it goes through you’ve got bases loaded, 1 out, and your #2 hitter at the plate. You do NOT get thrown out at second there. Go watch that play again in real time. The tag was on at 2B in less than a second after the ball came off the bat. How does the shortstop get there before Cozart? They were breaking in opposite directions. SS moves towards 2B on contact, runner moves towards 3B. Again, watch it in real time. Off the bat that looks like a sure thing single. The SS has no other job but to cover 2B on that play while Cozart is trying to score from second on a single. That was not a TOOTBLAN. It was bad luck. Runner isn’t supposed to be heading to third without knowing if the ball is going to be caught, and the shortstop isn’t heading to second until he knows where the ball is heading. I just love the people on the internet who hide behind anonymous user names accusing people they have never met of not having mental toughness. I think that’s called irony in literature. I’m so glad we have a rule about talking about the game and not the posters. Weren’t you the one who just recently said it’s illegal to post comments about other people and not the Reds? Talk about IRONY. Do I now have permission to criticize you and ignore the game? If Cozart decides he wants to challenge me to a public debate, I’ll be glad to accept. He’s been busy trying to keep playing baseball with broken fingers. I guess that’s what mental toughness is? Running the bases with painful fingers? And now Cozart comes out, presumably with an injured right hand. Sheesh. Wouldn’t be surprised if he has a broken finger or two. Couldn’t get a great look, but it appeared his index finger and second finger were turning purple. I’m not a doctor, but that’s not a good sign. Coulda and shoulda been better, but it definitely could have been worse. The good news is we got us a new ballgame. 3-3 bot. 7th. Go Reds! Go Jumbo! At least we tied it up and Bailey had a solid outing minus the first. Charlotte you thinking jumbo could replace Broxtons role if we a trade chapman and make broxton closer or b we trade broxton and move jumbo to setup role? Dale because of the size of Broxton’s contract, I believe $9M in 2015, I think you have to seriously consider dealing Jonathan. I would not trade Chapman. What do you think? Is his weight a long term issue? That and his old rookie age? More concerned about weight. I believe Broxton is older than Diaz. Man, we could put that $9M to good use. My guess is that Jumbo would get MLB minimum ~$500K. Both are 30. Diaz a couple months older. Yes, Diaz would play for league minimum. Yes, we should be shopping Broxton for a hitter. I wouldnt trade chapman unless his contract was or becomes an issue. I think with broxtons past health issues that we should at least consider a trade with brox…. If it is to an american league team and most definitely not within the division. Jumbo in the 7th, has a nice sound to it. In the close up of Jumbo he just looks happy to be out there. Good inning for Jumbo. Nice play by Negron at 3B. The Reds base running blunders is an ongoing problem, do the coaches not address the issue, or do they think its beneath the players to dare lecture them on proper base running. Is it really possible to throw an 89 mph changeup? Isnt that really just another fastball with the juice removed? Not when you throw a 99 mph fastball it’s not. The putting of Logan O on the DL for shoulder stiffness, I wonder he has had it for awhile and is just now saying something? Still haven’t heard any news about Tony C with his shoulder stiffness. Said he first noticed it the Saturday before the AS break. They were hoping it would get better with time off and it didn’t because of the break and the backdating, I think his return date is as early as Monday or Tuesday. I heard tendinitis on the radio. So maybe a shutdown for the year to avoid another injury. If that’s about Tony C. not only does that impact the balance of this year it takes a player out the potential trade pool. Do the Reds have an award for the most gritty strikeouts in a season? Because Skip is bearing down on that record. Jay Bruce has no clue at the plate. Imagine that, Bruce strikes out on a ball in the dirt. There is no way Zack Duke is as good as he made himself look against our guys. Bruce, who doubled in a Reds run in this game, didn’t look any worse than Frazier did against Duke. And it’s easier for a RH hitter to face Duke’s slop. It is Zach Duke, what was that team that let him get away last year? Zach Duke, would have been good to keep him. Curious if jumbo gets another inning to work. That last one was so easy i would think so. Especially with a possible extra inning situation. Price didnt take my phone call. Don’t understand why they took out Diaz. He only threw 14 pitches and completely overmatched the Brewers that inning. Let him go two. 14 pitchers; 5 starters, 9 relievers. Keith Law posted on ESPN.com his updated Top 5 minor league systems. Cubs are #1, Pirates are #5. Crazy how everyone in our division has a better than average farm system. Dang it Brox, throw strikes. Per your request. Sit down, Braun. Fall behind Weeks 3-0, now fall behind Braun too. Not a recipe for success. We took out Jumbo so Broxton could come in and do this? Got PED boy out !!! Beautiful ko of steroid boy. Braun never moved his bat off his shoulder. Brox has thrown 7 balls and 7 strikes. Somehow he has 2 K’s and no walks. FoxTrax showed that pitch to SO Braun was right on the outside corner. Good to hear. Maybe let him sit tomorrow, and with the off-day Thursady he can rest it until Friday evening. Big time grateful for that news… This team can’t lose anymore starters. Thanks for that update, that’s certainly some good news. Do it on the way back in the dugout ! Broxton really is a marvel. Basically just relies on a well-placed fastball. That’s it. Batters know it’s coming. He moves it all around. Not afraid to pitch from behind. MLB Gameday showed he mixed in a few sliders, too. 7 of his 19 pitches, to be exact. Brox has pretty good velocity tonight. Hit 94-96 on several pitches. The “Big Sequoia” is a force to be reckoned with no doubt. I made the mistake of listening to Thom on the reds broadcast, what is talking about? I need to go back to listening to the out of town broadcast. Agree Cozart is fine, as an 8 hitter. Bingo. Shortstop is the one position on the team where you can tolerate a guy who is weak offensively but is great on defense. Just leave him in the 8-hole and be happy with him. Pena is spraying them all over the place. I would have to say that if Price is willing to tell Ludwick he is now an official platoon player that he should be telling Cozart the same thing. Zack plays tremendous defense no doubt but his batting skills are diminishing with experience. Santiago has looked good on offense so maybe he should get playing time at short more often since we how Negron on the roster. No doubt. Kind of guy that would be a pleasure to hang out with. I’ve developed an almost irrational faith in Pena. Somebody really, really needs to step up for the Reds right about now. Go Reds! Isn’t it, uh, special when I almost look forward to: Pena, Negron, Santiago? He has a tree in his mouth. Negron hurt on the bounce? Really? We need to sacrifice a goat or something. This injury luck is getting a bit outrageous. I know where we can get the goat. Let me do a little research. Surely there is something I can do from here. Ouch! I bet he heard the doorbell ring on that. Looks like he’s ok thankfully. Reds gonna have enough players to get through July ? I guess a big positive here is that the Reds are hanging tough with a team that is so banged up and playing so many back ups. LeCure? Don’t have much faith in him right now. Lucroy could end it with one swing. Docmike called it. Well done sir. Well done. After tonight, you and I should both go to Vegas. I saw that coming after Lucroy took that first whopping’ mid 80’s fastball right across the plate. What a disaster. LuCroy always scares the mess out of me. With good reason it seems. is there anyone on this board that didn’t see that coming from a mile away. Le Sam with the 85mph fastball right across the plate. We lose the game with a guy throwing 87 mph fastballs up there to an All-Star. But doesn’t Chapman look awful nice sitting over there in the dugout? This doesn’t happen if Price had been willing to let Jumbo or Broxton go multiple innings, or if he had let Chapman pitch despite it not being a save situation. Of all the Brewers to beat the Reds I’m not surprised it was Lucroy, that guy is a termite to the Reds wooden house. Dang it, dang it and dang it. Brewers hit 4 solo home runs tonight. Injuries look like they are taking their toll. This team continues to play hard and I tip my hat to them. Nice to see Homer bounce back from a tough 1st inning. Nothing else to say – day game tomorrow. I saw where Rizzo hit 2 homers tonight against San Diego, giving him 25 on the year. Bet the Padres are loving that trade right about now, huh? Not sure why Chapman sitting over there in the bullpen?? I know the Reds are banged up, but they are making simple mistakes for a team that is shorthanded, cannot afford to make mistakes….Heisey misplaying two fly balls last night. Frazier not scoring on the double by Bruce, Ludwick striking out with runners on 1st and 2nd and One out. Cozart taking off and being doubled off second by the Hamilton line drive. Also on Price, Why not let Jumbo pitch 2 innings? Why not let Broxton pitch 2 innings? Reds starting pitching are going to keep the Reds in some ballgames, but I see them losing alot of 1 run games, because of the above mistakes and an inconsistent Bruce and Ludwick not worth anything now. In the last 5 games the offense has delivered 2.2 runs per game. The pitching staff has allowed 4.6 runs per game. This will be the second time through for the starters starting tomorrow. Looks like we will know more by the end of July than we want to. One bat won’t fix this offense unless the current bats hit. 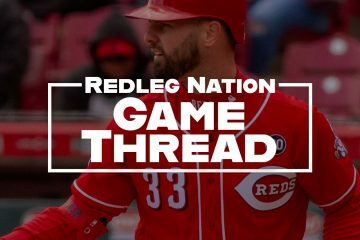 Is it just me, or does tonight’s game thread have more glitches than the Reds lineup. For example the same two comments have been at the bottom of the thread for the past hour even though I have refreshed the page many times. Is it just me or does lucroy win it on a walk off almost once every series, we play the brew crew? We really need a manager that is willing to step outside “the book” more often. Letting relievers go more than 1 inning, using your closer in non-save situations, stuff like that. Yes, I know Price is not as bad as Dusty was. He could still be a lot better.